Simple potato curry cooked with yogurt. This can be eaten during fasting days too. 1. Boil and peel the potatoes. Cut into cubes. 2.In a pestle and mortar grind coarsely the coriander leaves, mint leaves, green chilli and ginger. 3. Heat 1 tbsp oil and add the masala paste. Stir fry for a minute and add the potatoes, salt and turmeric powder.Mix well and sprinkle a little water and simmer for 2 - 3 minutes. 4. Now churn the curd with a little water and stir into the potatoes and simmer for 2-3 minutes further. Temper with the cumin seeds. This sabji goes well with puris. 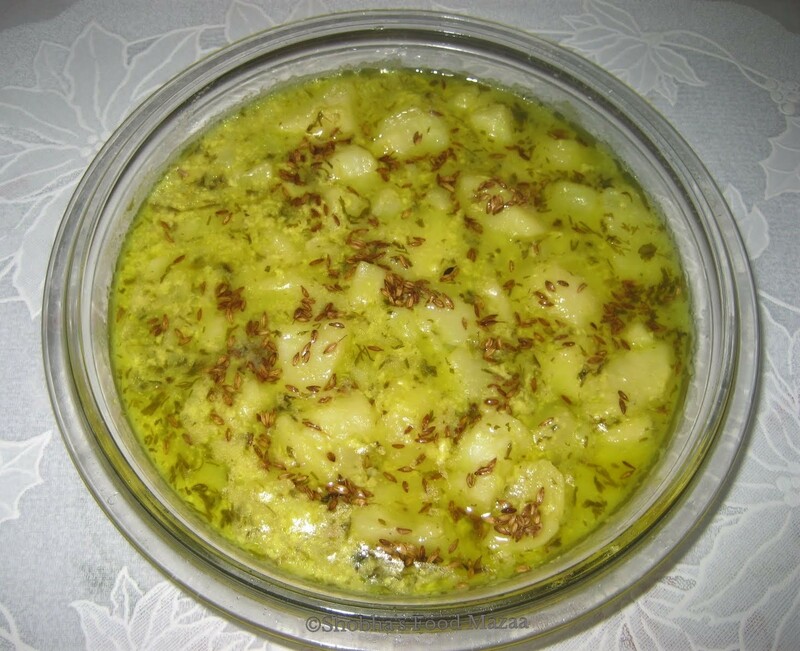 My fave Dahi aloo, looks yummy. sometimes the curd curdles when cooking...how to prevent that, shobhaji? Hi Shobha, you have a great blog. Sorry for the delay in replying. Thanks for sending this to my event. It was a pleasure participating in ur event, though I could not send many entries as I was travelling. Yummy side dish and curd is my favorite. Thx for linking to the event.